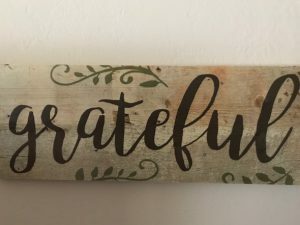 There is always something to be grateful for. Always. And the fruit of gratitude is joy. Slow down, take a breath and fully receive the blessings planted throughout each day. What is right in front of us is so often what we miss. Open your eyes and heart. Jeanne gave me a grateful sign for my birthday. I put it in the living room right next to the television so I can’t miss it. Don’t miss the signs and follow accordingly.